You record it, I say it! Designed for the blind and visually impaired, the Reizen Talking Label Wand is a state-of-the-art voice labeling system that keeps you organized and helps you identify household items easily and efficiently. This talking label identifier comes with 232 labels - 160 round, tactile labels and 72 rectangular, washable labels. Use the round labels for food, medicine, files, music, and more, while the rectangular washable labels can be used for those items as well as clothes. 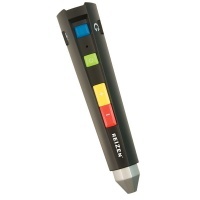 This talking label pen can also switch between English and Spanish languages, and you can re-record labels for a new item. The Reizen Talking Label Wand comes with 2GB built-in memory card with 250 hours recording time. The voice prompts are easy to follow, and there is unlimited recording for each label. There is also a 3.5mm headphone jack and volume control for discreet or easy listening. Uses 2 AAA batteries (Included). Free Batteries are included with product.